...Well it is to you. I found the cutest thing on Pinterest the other day. It is my inspiration in so many things from decor to food. This I just couldnt pass up and it was so easy. You can totally do this at home with something as easy as Microsoft Publisher. The hard part was choosing my celebrity and fictional loves! I spent forever trying to come up with the perfect ones. I could have just copied exactly the famous lovers you see here in the picture of my inspiration, but I wanted it to be more personalized to me. The people I think of when I think of famous loves and for me Lennon and Ono just aren't it. And Im pretty sure Hansel and Gretel were brother and sister. Thats weird. So of course, I made my own. 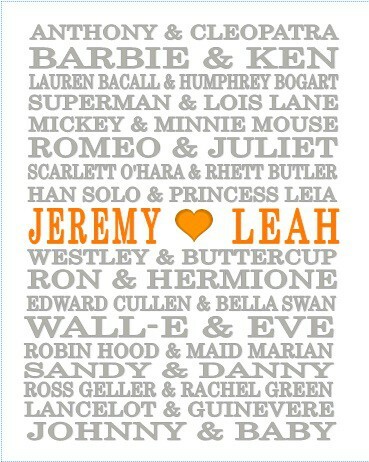 I got everyone from Bacall & Bogart to Johnny & Baby to Ron & Hermoine. Yes, I put a Harry Potter charachter on my Love Picture. 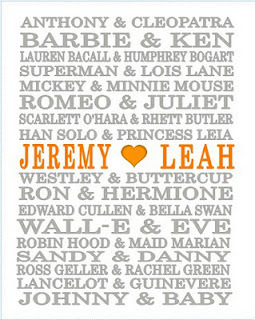 And you can choose your own favorite couples to put on yours and make one too! Or I can make one for you. If you want to do it, I recomend using Microsoft Publisher, its a better choice than Word. 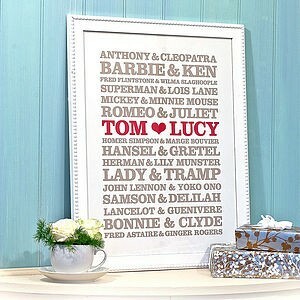 Choose the colors you want to use, and create each couples names in a Word Art. Make some larger than others, which will naturally happen on shorter names. You dont have to change the size usually for the longer names, it will do that for you. Then just make yours in the middle, slightly larger and the others and in your chosen color. Print it up and chose a nice frame and voila! It comes out looking great! Ive never seen one of these in someone elses house, so if you take the time to make one, you will have something truley unique. So of course after I did this, I wanted to do more. I started thinking, I want to include this on my family pictures wall I have in the works. So I need the whole family included. 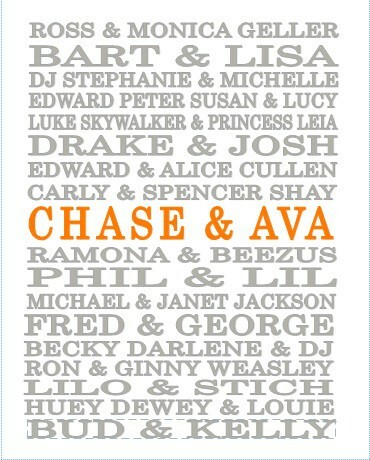 Ava and Chase should definitely be included in the company of the coolest siblings ever! So I made one for them too. This one was a lot more difficult. 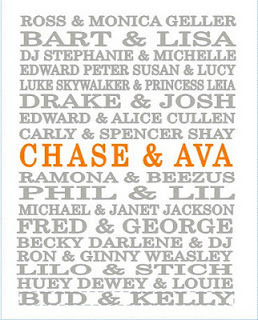 It is dang hard to come up with a bunch of famous siblings, real or fictional. And Im not including a Kardashian! Or a Brady! Chase actually helped on some, he thought it was really cool and insisted on having brother and sister Carley and Spencer Shay included from his favorite show iCarley. I cant wait to print these up and get them framed. I havent dont it yet because as I said I want to put them on my family picture wall I'm planning and I dont have it all ready and planned out yet. But they will definitely be gracing my living room walls and I cant wait to make some more for my lovely friends and family members!